1) Cut the pork belly into medium sized 1 inch strips. 2) Wash the pieces well in a bowl of water, drain, and let the pieces dry completely. 3) In a bowl, combine the pieces with the salt to taste and baking soda. 4) Heat a deep heavy saucepan over medium-high heat and add the vegetable oil. Add pieces of pork and cook, stirring occasionally, until the fat has separated and the pork skin is lightly golden. 5) Now remove the pork skins with a wire strainer, then drain completely on paper towels. Let cool, reserve. 6) Meanwhile, let the lard remaining in the saucepan cool slightly – it should remain liquid. Strain it through several layers of cheesecloth in a sieve into a large mixing bowl. 7) Place the strained liquid lard into an empty saucepan on medium to high heat and cook until hot but not smoking. In batches, return the pork skins to the fat, making sure not to overcrowd the pan. 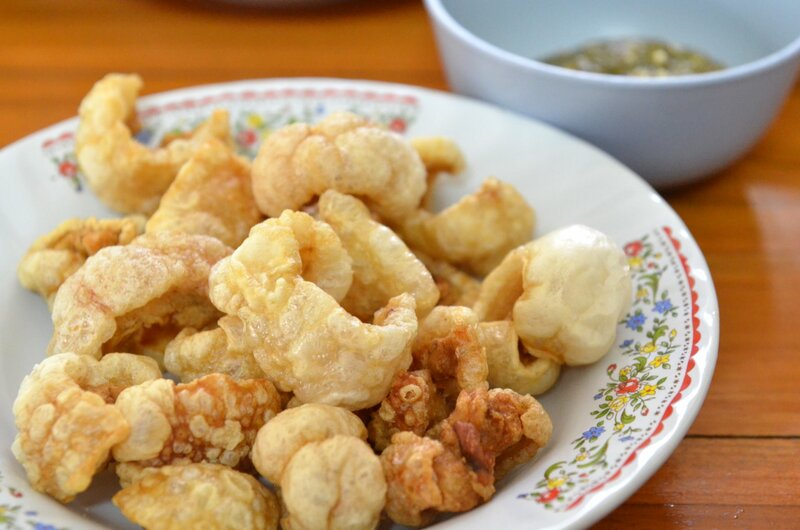 Let the pork skins fry for 3 or 4 minutes until they become a rich golden color. 8) Remove them with a wire strainer before they darken, and drain as before on a paper towel. 9) Once dried, they can be served immediately, while still warm. They can also be stored for up to 3 days in an airtight container.